Nintendo has unveiled a new DS model, dubbed the DSi XL, which will go on sale in Japan next month in a new games bundle, with a European release planned for early 2010. Rather than getting smaller though, as is usual for handheld consoles, the DSi XL is actually bigger than previous models. 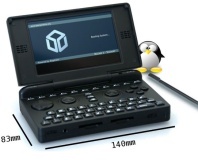 The DSi XL's new screen measures 4.2 inches, which is a 93 percent increase compared to the screen of the DS Lite. In terms of interface and core hardware though, it appears like it may be fundamentally the same as the DSi - complete with dual cameras and DSiWare support. 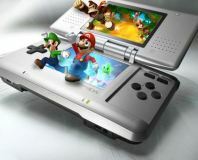 Nintendo will supposedly by targetting the DSi XL at older handheld users, or those who have more specific needs for a portable gaming system - such as surfing the internet, MP3 playback or playing graphic adventure or reading-intesive games. Thus, the screen is bigger to allow larger characters and more screen space. The DSi XL will also come with two touch pens, one much larger and easier to hold than previous models, and three pre-installed DSiWare games; DS Easy Dictionary and two unnamed Brain Training titles. The console will be available in Dark Brown, Wine Red and Natural White colour schemes when it launches in Japan for 20,000 Yen ($220 USD / £135 GBP). No word on an official European or American price just yet though. The OpenPandora project has opened pre-ordering for its relaunched hand-held console. 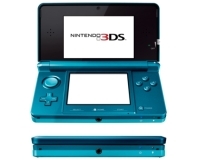 The 3DS has been delayed until 2011, according to Nintendo. The GPU in the 3DS has been outed - and surprisingly Nintendo isn't using any of the big boys.